Minerals are split into two categories: macro-elements and oligo-elements (aka trace minerals). If you’ve learnt Greek, you may immediately see the difference. It is quite simple: there are by definition many macro-elements in the body (around several grams), and few oligo-elements. The latter ones are nevertheless essential! The macro-elements are: calcium, sodium, magnesium, phosphorus and potassium. Let’s put aside the silicon for now and focus first on magnesium. It is a (macro) mineral that takes place in more than 300 metabolic reactions of the body. Why food is not enough? Both magnesium and calcium play several roles in the muscles and bones. They are often said to be complementary: calcium triggers action, while magnesium enables relaxation. In the muscles, the calcium is responsible for the contraction, and magnesium the release. I like the analogy used by Wladislas BARATH in his article “Magnesium: the bide, or what you are not told for it to work “: calcium is the ON button, magnesium is the OFF button. So I’ll use it too. If you are magnesium deficient, you do not have an OFF button: the body is locked in action. It can not rest. Difficulties in falling asleep, awakening in the middle of the night, cramps, involuntary movements of limbs, tired when waking up, foggy brain (difficulty of attention and memory) . Does all that remind you of something? Then you should think about the OFF button. A body that does not rest cannot decontaminate (and keeps making more toxins). The mitochondria are the cells responsible for energy production1 2 (known as ATP). Magnesium is one of the necessary elements for their proper health and action. Logical consequence: a lack of magnesium triggers a lack of energy. Magnesium helps evacuate the toxins3 produced by pollution and stress. That could explain why 80% of the population is deficient. Magnesium plays an important role in nerve and muscle functions, and in the formation of bones and teeth. It also takes place in the regulation of blood glucose and insulin sensitivity. Magnesium is distributed in the body as follows: 56% in the bones, 34% in the tissue cells, 1% in the blood . It seems quite logical that a blood test cannot reliably reflect the total amount of magnesium in the body. This is even more true that the bioavailability of magnesium can vary: it is its ability to penetrate into the bones and the cells. It is possible to have a deficiency in bones and cells, while the blood is saturated. Let’s return back to this bioavailability stuff (ability to penetrate the cells). You decide to supplement yourself with magnesium: it relaxes you a little, there are some beneficial effects… but after a few days: it doesn’t work anymore. You then do a blood test: no magnesium deficiency! So you stop the supplementation: once again, a wrong track! I have read many testimonials like this, and it seems logical. The problem in that story is that the body can not use the magnesium you intake. The magnesium just wanders through the blood, waiting in vain to be used. This is where silicon comes into action (the moment you were all waiting for). The secrets of magnesium strength5. I haven’t read it, but I found a study that confirms that it works for rats6 (works for me!). Several testimonies also seem to confirm it. So I experienced it myself: yes, it seems to work! Thus, silicon allows the penetration of minerals through the cell membrane and therefore makes it usable for the cells. Because yeah, it is a pity to have all that magnesium in the blood and not being able to use it! As a bonus, the silicon would also be known as chelating (detoxifying) aluminum, and it takes place in the fortification of the bones7. In order to be usable by the body, the silica must be converted into a soluble form: called organic silicon, or colloidal. This is usually found in organic stores. You can also find Dissolvurol in pharmacy stores (less than euros a bottle, therefore affordable). It is taken as drops, as we will see later. Silicon is naturally found in vegetables, whole grains and some plants. The richest are nettle, horsetail and bamboo. During my researches, I came across a study on women who had miscarriages, and it showed that a selenium deficiency prevents magnesium from penetrating the red blood cells 8 So it seems important to check that you have no selenium deficiency. Especially, when we are exhausted we often have deficiencies in… almost everything! I will not dwell further on the selenium because the article is quite long, but note that it would also have a chelating role on arsenic 9 and that it enables the absorption of iron and other minerals10. The body hasn’t decided to make it easy: supplementation with vitamins B, and particularly B6, would be beneficial in addition to magnesium. There is even a treatment based on magnesium and vitamin B6 that improves behavioral disorders in children11. Once again, this article is too long and I won’t stretch it out even more with vitamin B details. As if it were not enough complicated, it would seem that fibers also have their role to play12. But since you eat fruits and vegetables, this is not a problem for you! Right? It is estimated that a century ago the diet brought us about 500 mg of magnesium per day. Today it is between 150 and 300. I read it but I didn’t manage to find the source, but it’s not very important. Why such a change? Industrialization of course. On one hand, industrial food often uses compounds that have no interesting nutrient (gluten, starch, sugar, white flour, refined sugar, iodized salt, etc. ), and that is to the detriment of fresh fruits and vegetables. On the other hand, intensive farming depletes the soil, and even if you eat a lot of vegetables, it is usually not enough to meet your daily needs. A bit of help from supplements is therefore welcome. The daily French recommendations are 6 mg / kg / day. This is 360 mg / day if you weight 60 kg, 480 if you weight 80. This is of course just an approximation: it may vary depending on your health, the pollution and the stress that undergoes the body. Magnesium supplementation can be done regularly throughout the day (avoid taking to much at once, your body won’t take it). This can last up to 3 months, after which it is advised to take a break, so that the body doesn’t get used to it too much (no science in here, so you can skip this advise). As for silicon, Kathy Bonan, that we saw previously, advises to take it only at the moment when magnesium seems to stop working. The dosage is then 3 times 15 drops of silicon (Dissolvurol), with each meal of the day (one day is enough because the needs are low). If you want to automate the process, this is about once every 15 days. As for Selenium and B vitamins, I’d rather let you experiment with the quantities that work for you, rather than giving a random advise. Magnesium is found in many variations, and for all prices. I personally take magnesium chloride (sometimes called Nigari). This is one of the cheapest and it does the job for me. If you have tried different forms of magnesium, do not hesitate to write about it in the comments and tell which ones have worked best for you. It is also possible to absorb magnesium through the skin. To do this, pour one to two cups of Epsom salt in your bath (it has to be hot as the heat opens the pores of the skin), and immerse 20 minutes or more. Epsom salt, or magnesium sulphate can be found in organic stores (usually much cheaper than in pharmacy stores). I havn’t tried yet but it says that relaxation is guaranteed! 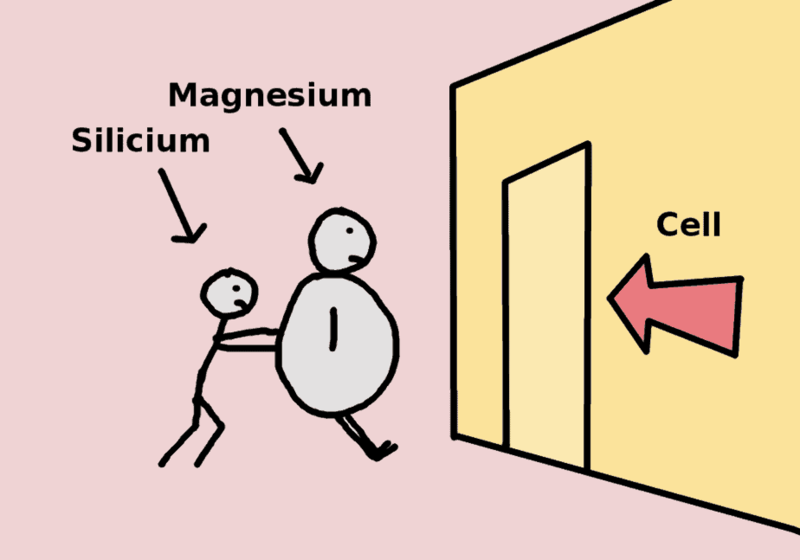 While the lobbies wanted us to believe that we need to drink milk in order to bring calcium to the bones, it is actually magnesium that we really need. It is so efficient that it is even used to treat attention deficits in hyperactive children 13. Paradoxically, it also enables the body to better produce its energy (in the mitochondria). The lack of magnesium may explain why so many people experience difficulties sleeping. Our body is blocked in action mode and releases toxins, which in turn consumes the little magnesium that was left… it is a vicious circle and supplementation becomes necessary in order to fix these deficiencies. An organism can only recover when the nervous system slows down. The body is a complicated machine and supplementation with magnesium (like many others) requires the assistance of other minerals and vitamins (silicon, selenium, B vitamins, fibers …). Organize yourself accordingly and try the experience! I am waiting for your feedbacks in the comments! Does magnesium help you to overcome bad sleep and fatigue? Role of Magnesium and other divalent cations in ATP Utilizing enzymes. Chemical mechanism of ATP synthase. Magnesium plays a pivotal role in the formation of the transition state where ATP is synthesized from ADP and inorganic phosphate. Protective effects of selenium, calcium, and magnesium against arsenic-induced oxidative stress in male rats. The action of excessive, inorganic silicon (Si) on the mineral metabolism of calcium (Ca) and magnesium (Mg). Red cell magnesium and glutathione peroxidase in infertile women– Effects of oral supplementation with magnesium and selenium. Protective effects of selenium, calcium, and magnesium against arsenic- Induced oxidative stress in male rats. Selenium deficiency as a cause of iron and other minerals. Improvement of neurobehavioral disorders in children supplemented with magnesium-vitamin B6. I. Attention deficit hyperactivity disorders. Calcium, magnesium, iron, and silicon scales. Previous Previous post: Heavy metals intoxication: we’re all affected!